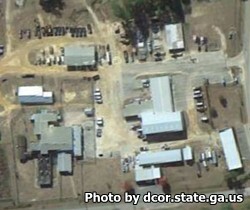 Thomas County Correctional Institution is located in Thomasville Georgia. It is a medium security facility that can hold up to 185 adult male felons. General population inmates are housed in seven dormitories, inmates who are in segregation are held in single isolation cells. Offenders can be selected to work outside of the facility in various support roles for the county government including road construction and maintenance, bridge and building maintenance, recycling and sanitation. Inmates at Thomas County Correctional Institution can earn a GED while incarcerated, participate in bible study, an inmate choir, and a variety of worship and prayer services. Vocational activities include automotive repair, and construction and heavy equipment operation. Contact the facility at the telephone number provided for more information on the visiting hours. If you know the visiting hours please leave a comment below.